December 20, 2011 - US Airways’ 32,000 employees pledged more than $1.2 million to the airline’s annual “Hope Takes Flight” campaign to benefit the United Way. This year’s campaign, which ran between Sept. 23 and Nov. 13, contributed to the nearly $9.5 million US Airways employees have raised for United Way since 2000. The United Way works to address health and human needs in more than 1,300 communities across the country. “Our 2011 United Way company goal was exceeded thanks to the generous spirit of our 32,000 employees,” said US Airways’ Chairman and CEO Doug Parker. The “Hope Takes Flight” campaign is more than writing a check. US Airways employees participated in a variety of fundraising events, such as the ”Crewmember for a day” obstacle course, an online auction, as well as the airline’s popular Jet Pulls in its three hub cities of Charlotte, N.C., Phoenix and Philadelphia. 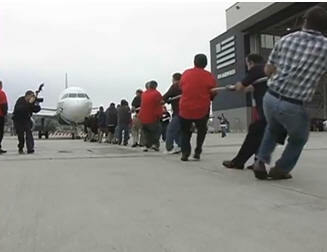 The winning team of employees in Philadelphia pulled a 50-ton Airbus A319 the required 15 feet in 4.44 seconds. The Jet Pulls are US Airways’ most popular United Way fundraiser; a record number of teams competed in 2011 and raised more than $20,000. US Airways employees routinely support their communities through volunteerism and other initiatives on a year-round basis. The airline’s dedicated corps of more than 3,200 Do Crew employees volunteer in Charlotte, Washington, D.C., Winston-Salem, N.C., New York, Philadelphia, Phoenix and Pittsburgh, and have volunteered more than 20,000 hours with 100 different nonprofit organizations in 2011. United Way is a worldwide network in 45 countries and territories, including nearly 1,300 local organizations in the U.S. It advances the common good, creating opportunities for a better life for all by focusing on the three key building blocks of education, income and health. The United Way movement creates long lasting community change by addressing the underlying causes of problems that prevent progress in these areas.